When historic buildings are left vacant they are at a greatly increased risk of damage and decay as well as being a potential blight on their locality. The best way to protect a building is to keep it occupied, even if the use is on a temporary or partial basis. It is inevitable that some historic buildings will struggle to find any use, especially in areas where the property market is weak and the opportunities for sale or re-use are limited. However, such buildings may become centrepieces of future regeneration and safeguarding will allow them to fulfil their social, cultural and economic potential. 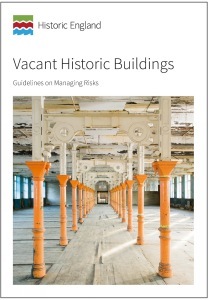 This guidance is intended to help owners and purchasers of vacant historic buildings to reduce the risks by undertaking a range of precautionary measures and adopting an ‘active management’ approach that can prevent unnecessary damage, dereliction and loss of historic fabric. Owners will also benefit by maintaining the value of their assets and increasing the chances of bringing them back into permanent use. The guidance explains how to decommission buildings that are about to be vacated, as well as how to look after buildings that have already been vacant for some time. David Pickles is a Senior Architect with Historic England.